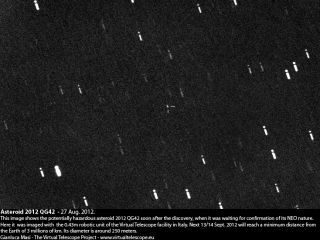 Asteroid 2012 QG42 soon after its discovery. A newfound asteroid that may be the size of three football fields will whiz by Earth on Thursday (Sept. 13), and you can watch the close encounter live online. Asteroid 2012 QG42 is between 625 feet to 1,400 feet wide (190 to 430 meters) and was first spotted by scientists last month. Researchers say the space rock has no chance of hitting Earth this week when it makes its closest approach on Thursday. The asteroid will pass by at a safe distance of about 7.5 times the Earth-moon distance. The moon is, on average, about 238,000 miles from Earth. Asteroid 2012 QG42 is, however, listed as a "potentially hazardous asteroid" by the Minor Planet Center at Cambridge, Mass., meaning it may pose a threat in the future. At least two online observatories are tracking the asteroid's pass by Earth. The Virtual Telescope Project has been tracking asteroid 2012 QG42 since last week and posting images online. Asteroid 2012 QG42's flyby comes a few months after another recently discovered space rock, asteroid 2012 LZ1, made its closest approach to Earth just days after popping onto astronomers' radars. "Near Earth Objects have been whizzing past us lately, undetected until they have been practically on top of us. This illustrates the need for continued and improved monitoring for our own future safety," Bob Berman, a Slooh editor and Astronomy Magazine columnist, said in a statement. "It is not a question of if, but whensuch an object will hit us, and how large and fast it may be going." Berman added that to observe near-Earth asteroids like the one passing by on Thursday "provides instruction and perhaps motivation to keep up our guard, as well as a sense of relief as it speeds safely past at a mere one fifteenth the distance to the nearest planets." Berman will join Slooh president Patrick Paolucci and Slooh engineer Paul Cox to provide commentary during the organization's webcast.